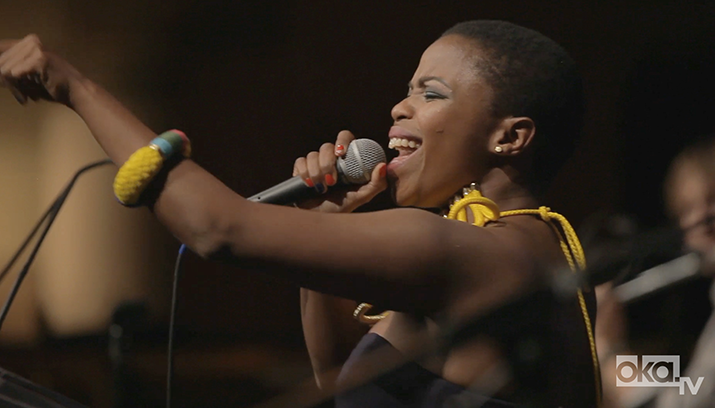 We caught up with South African music staple Freshlyground at NYC's Gotham Hall to chat briefly about the band's shift in sound and aesthetic from "happy and positive" to surrealist and edgy. After emerging from a two-year recording hiatus, South African afro-pop staple Freshlyground released their 5th studio album, Take Me To The Dance. This album marked many firsts for the band, which has been a collective for ten years. TMTTD was the first time they recorded with Grammy Award-winning producer and session player Steve Berlin, and it was the first time they took charge of all their own marketing and distribution, partnering with South African retailer Pick n Pay for the release. Freshlyground also brought a new sound and style to the album. When we premiered their music video for the infectious electronic single "Take Me To The Dance," FG fans were surprised by the shift in aesthetic. Instead of what Kyla-Rose Smith describes as "happy and positive and Rainbow Nation," the video for "Take Me To The Dance" is rather dark, surrealist, and edgy. We caught up with the women of Freshlyground, violinist Kyla-Rose Smith, and lead vocalist Zolani Mahola, on their latest venture to New York City to accept the 'Next Generation' award at the Shared Interest Awards Gala. Freshlyground were dressed to the nines to perform for fellow award winners of the evening, singer, actor and activist Harry Belafonte, and freedom fighter and social justice activist Father Michael Lapsley. Before accepting their award we briefly chatted about the choice to rejuvenate their sound. Catch the full interview below and DL Take Me To The Dance here.